We provide a comprehensive support and connection service for biomethane producers who want to inject their product into our distribution network. We’ll help you understand available capacity on our network; the most suitable injection point and the equipment, processes and costs involved. We’ll also guide you through all the legislative and legal issues, to ensure your project complies with regulatory standards. Our process has five key stages, and you’ll have a dedicated case manager working with you every step of the way. We’d love to hear about your project, so please get in touch. Tell us about your project. We can advise on how to get your gas into our grid. This handy infographic shows the key steps in the connection process, from initial enquiry to getting your gas flowing into our network. 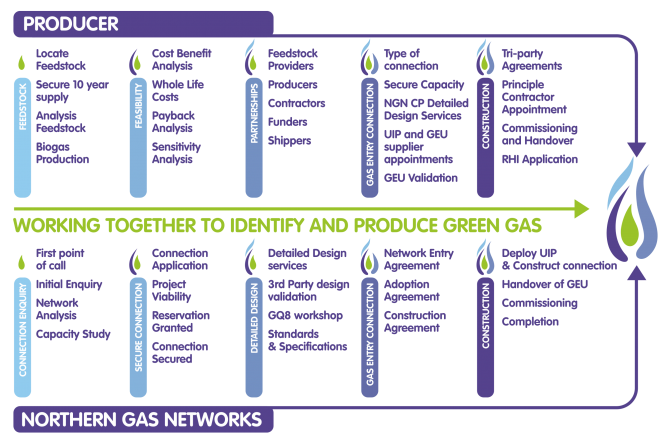 This diagram shows which elements of the connection equipment are your responsibility to maintain, and those that NGN will adopt. The function of each piece of equipment is labeled and explained.